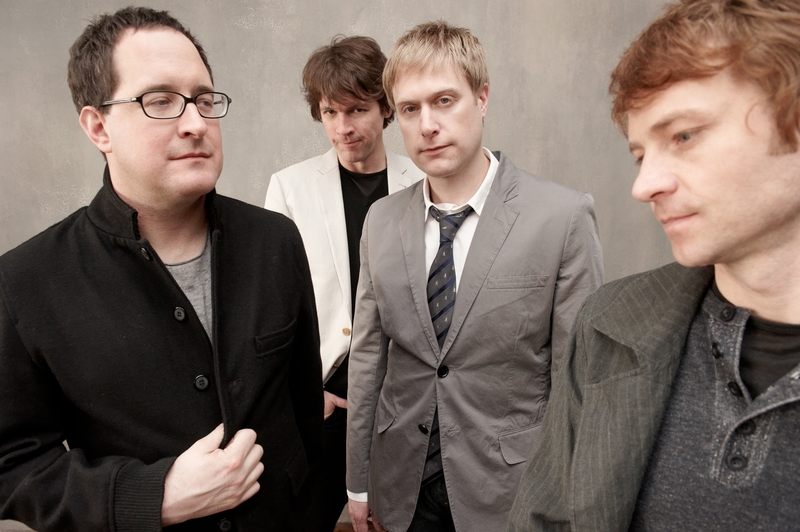 The Hold Steady performs April 8 in Town Ballroom. If, as a member of the 99 percent, you find modern American life a touch stressful, Craig Finn – singer, lyricist and frontman with Brooklyn’s the Hold Steady – feels your pain. He knows what it’s like to “(wake) up with that American sadness,” to spend your life veering between jubilant, near-euphoric peaks and the morning-after default setting of anxiety and existential dread. You’d think the guy had spent a decade playing in an indie-rock band in Buffalo, or something. “Teeth Dreams,” the Hold Steady’s blistering new album – lent substantial heft by the addition of guitarist Steve Selvidge, who teams with original picker Tad Kubler in service of an awe-inspiring wall of sound – kicks off with “I Hope This Whole Thing Didn’t Frighten You,” which finds an older, wiser and more weathered Finn offering a disturbing character sketch atop a rollicking din that sounds like Guided By Voices covering the E Street Band. The tone is one of alarm, a sense of impending doom looming over the brutal sonic attack, which somehow still sounds like a party you’d like to attend. Hanging around in bars while watching your own dreams die right alongside those of your friends has never sounded like such a great time. “Teeth Dreams” arrives already sounding like a dog-eared classic. This is highly literate garage rock writ large. And it’s bound to sound fantastic when the Hold Steady blasts it out April 8 in the Town Ballroom. Young pianist Natasha Paremski is on the Buffalo Philharmonic Orchestra’s schedule next season, playing Brahms. She was here in 2009, playing Rachmaninoff’s Second Piano Concerto. I interviewed her a week beforehand, and I remember how exhausted she sounded, dragged away from her practice. All that hard work is paying off. Paremski, on this disc playing two ultimate warhorses, Tchaikovsky’s First Piano Concerto and Rachmaninoff’s “Rhapsody on a Theme of Paganini,” shows she is developing a very adept touch. She has an easy, adaptable technique. She was a protegee of the late virtuoso Earl Wild, who took her under his wing and would give her lessons in Columbus, Ohio, that lasted for hours. When Paremski played her Rachmaninoff here, she did it very well, but I remember she took a gentle approach to the big piece. Sometimes too gentle – it made me nervous, how delicately she began the concerto. And there are times on this disc when the music, for whatever reason, lacks muscle and momentum. She is wonderfully sensitive in the slow movements. Martin Helmschen, a German pianist on the youngish side, gives a clear-eyed performance of two of Mozart’s great piano concertos (admittedly, more than a dozen Mozart piano concertos are generally regarded as great). He does some modest, tasteful embellishments, and it sounds as if he is capable of doing more. The theme-and-variations Andante movement of the 15th concerto – a must-hear, if you have never heard it – shines thanks to his simple approach. And the 27th character has just the right gravity. I do not understand what is with the pianist’s unattractive, angst-ridden cover photo. What, you might ask, is the outermost point of jazz in the continental United States? Quite possibly, this bunch. Let me add three more: Charles Ives, Karlheinz Stockhausen and John Cage. How so? There’s no question that M’Lumbo’s musical collages wouldn’t have existed if Ives hadn’t tried to reproduce in his music that glorious moment in a parade where the marching band just gone past can still be heard blatting away in one key and the band to come is blaring in another. Add Stockhausen’s “Hymnen” reproducing the world’s anthems as they might be heard from outer space if the earth were one giant short wave radio and John Cage’s “Imaginary Landscape No.4” for 12 radios and you’ve got some idea of the experience of listening to M’Lumbo. This is a roughneck jazz band a la Sun Ra as it might be heard on the radio by someone trying desperately to tune in the right station and getting sound bleeds from all over the place layered over and under. So what it means when you listen, for instance, is every different riff of Michael Jackson’s “Beat It” played simultaneously. Or fragments of Frank Sinatra singing “Doobie Doobie Doo” during “Strangers in the Night” and, I swear, what sounded like Ezra Pound reciting his poetry. You hear them here both in the studio and live in concert from Joe’s Pub in 2012. Lest you wonder why Jane Ira Bloom – possessor of the most beautiful soprano saxophone sound in all of jazz – is a guest star here, remember that Bloom is the musician laureate of NASA and this is definitely music on “the big blue marble” as it might be found on radio wave in outer space. Popular Science indeed. Quite nutty and great fun. The Czech Supraphon has been one of the great wonders of the classical world since the 1930s. Here is marvelous proof that it continues to function at the highest level of classical music recording in the 21st century. These are, with only minor argument, the two greatest pieces of string chamber music by Franz Schubert, played by a young Czech string quartet that has worked closely with Milan Skampa, violist with the legendary Smetana Quartet. The quartet is named after Czech composer Pavel Haas, who died in Auschwitz at the age of 44. In the sublime Quintet in C-major – the last piece of chamber music Schubert ever wrote – Danjulo Ishizaka plays the second cello. This is among Schubert’s greatest music, performed by a young string quartet of enormous distinction in its 12th year of existence.